What’s The Deal with Chronic Pain? 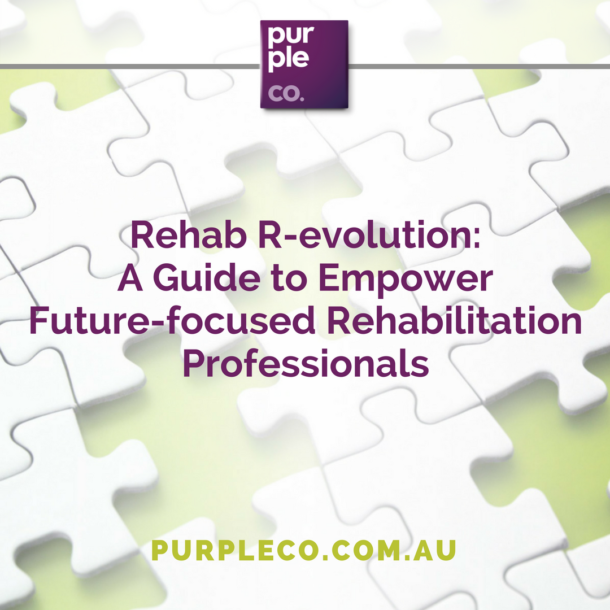 Guest post by Natalie Taylor, Rehabilitation Counsellor at Purple Co. So here’s a can of worms: what’s happening for a person with chronic pain? I had the opportunity to attend a chronic pain recovery workshop this weekend at NeurRa (Neuroscience Australia) facilitated by Prof. Kevin Vowles. For most of his career, Dr Vowles has been researching how we can help people with chronic pain get their lives back. There was one fundamental truth that kept presenting itself to me over the course of this weekend: the way that we currently approach pain in vocational rehabilitation is terribly, terribly ineffective. The search for answers: how does chronic pain work? We can try to answer “what’s the deal with chronic pain” from many different points of view. We could try could starting with the -ologies: what’s the biology, pathology, physiology, psychology and I forget-that-name-of-that-one-ology underlying the experience of pain? That’s already a PhD topic (many times over) in itself. We don’t know it all, but we know a lot about what makes chronic pain different to acute pain and the processes underlying both. And what about how pain makes itself known, felt and heard in a person’s life? How about the way that pain seems to slowly (or suddenly, for some people) strip away their sense of independence and engagement with the world? We could try to explain pain from this point of view, too. But, after this weekend, I’d argue that this approach to pain isn’t how we help people get back to the act of living their lives. By the time a client comes to us, they’ve probably been trying to grapple with and understand their pain for a long time. They’ve seen all the “-ologists”, had all the therapists, tried countless approaches and still, something isn’t right. They still don’t have their lives back. When you take the time to explore with a person just how hard they’ve tried to get better, there’s no doubt that the issue here isn’t that they need to try harder. They are already trying incredibly hard. And it’s exhausting. Research backs up this anecdote: Most people with chronic pain will have it for many, many years. Most surgical and pharmacological approaches to pain management don’t create a meaningful improvement in function and disability – meaning that people might feel more comfortable while they continue to watch life pass them by (to paraphrase Dr Vowles). The question then, for us, as Rehabilitation Professionals is this: are we barking up the wrong tree? Does it make sense to pursue medical certifications or “capacity” approval when these things are not proven to help people actually get back to the business of living? What would it look like if we helped our clients get off the hamster wheel of the search for a cure, which is far from guaranteed? What could a flexible, curious approach to living with pain look like? What if we were to talk to our clients about what they value in life and how they can start moving towards that, with pain, rather than the default of running away from pain at all costs (and potential opportunities to engage in life)? How could a life that one day involves working again help our clients engage in what they value? It’s a big shift. It won’t be easy. It won’t be comfortable. And it requires everyone to be on board with this idea of “rehabilitation” over “cure”. Not just the client, but us as rehabilitation professionals, our client’s family and treating doctors, too. This means we and our clients have a choice: which avenue do we want to go down? Do we want to commit to a cure… or commit to change? I’d argue that the second one isn’t perfect, but it offers a chance for our clients to take their lives off hold.